Wooden toys feel and smell better than plastic, and they're natural! A better alternative, both for your child's safety and for the environment, is to have natural wooden toys. When your baby is teething, anything and everything they can get their hands on will instantly go into their mouths. There are plenty of natural teething toys for babies on the market if you look for them. What used to be very difficult to find in person is now very simple to find with a quick web search. When considering wooden toys for your baby or toddler, be sure to get a high-quality product with smooth, rounded edges and curved corners. Plastic is a recent development in human history, and is entirely artificial. Wood is ingrained into our being, pun intended, and has been a key part of human development since the very beginning. Wood stimulates the senses, with a subtle feel that no plastic can duplicate and a wonderful, natural smell. Of course, from a baby's point of view, it tastes pretty darned interesting too! Natural, unpainted wood is non-toxic, free of artificial chemicals and safe to go in your baby's mouth. 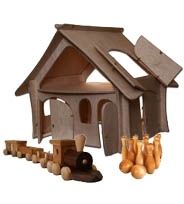 The high quality wood products you'll find in any links in this article also have wonderful smooth edges and rounded corners to enhance the safety, look and feel of the toys. While obviously a tree had to be cut down to make wooden toys, trees are often cut down to create the energy used to make plastics, which also happen to be made of oil. When the toy eventually goes into the trash, as all toys will ultimately do, wood will not harm the environment or be damaging in landfills. It won't give off ozone-killing, global warming gases the way plastics will. Unpainted wood is an entirely environmentally friendly material. How many toys can make that claim? So when looking for toys for your children during the next birthday or gift-giving season, please consider natural wood toys. It's better for you, better for them and better for all of us.